Perfect for displaying your images in a professional manner. info_outline Get a free SEO Report today. More information. A gallery is a great way to display your products, photographs, services or any other form of images in a professional manner. 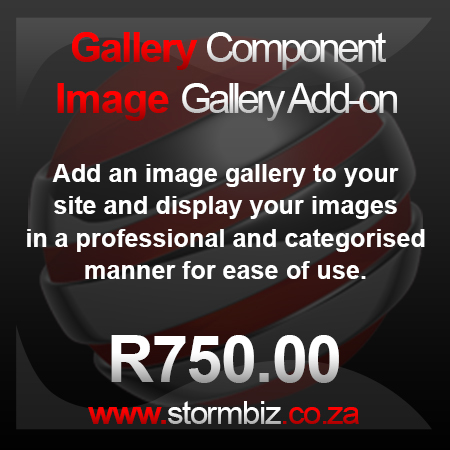 You specify the categories you require, and images can then be submitted to those categories to display in your gallery. Our galleries are easy to manage, and responsive for mobile devices. The best website technology for your images. Shop with confidence - payments securely processed via PayFast / EFT. Websites Designed within 21 Days of receiving ALL content. All Websites Designed with Joomla C.M.S. - putting you in control. Never pay another component license. - Buy Our Joomla Management Package. Take the next step - Start advertising your site today!